Well, hello! You'll never guess what I've been up to over the past couple weeks. Okay, I'll just tell you. That baby boy? The Inside Baby that was making me huger and more miserable by the minute? He finally decided to make his entrance into this crazy world two weeks ago and it turns out he's been making up for giving me a massive ongoing case of heartburn for the past nine months and a myriad of other aches and pains by being an absolute Superstar Outside Baby. Nursing well, even sleeping well, he is the stuff of newborn dreams, I'm telling you. I will be sure to share more stories and photos as the weeks go on and we get into a groove around here. But in the meantime, I wanted to take a quick minute to share some tips with you about a recipe from Pure Vanilla. 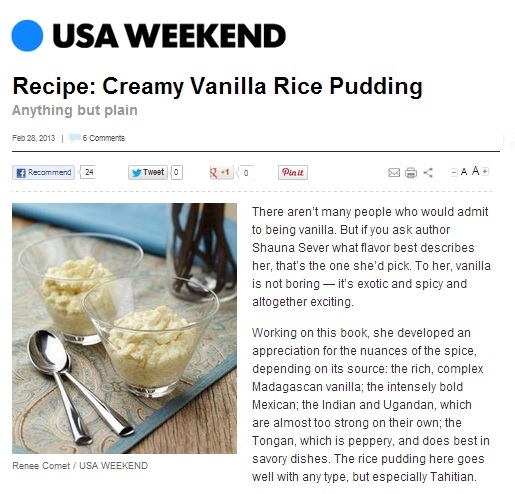 Turns out, at the exact moment Sir Baby was making his entrance, the fabulous folks at USA Weekend published a lovely piece on the cookbook and the recipe for Creamy Vanilla Rice Pudding. And as a bit of press in a national publication is wont to do, it's garnered some attention and filled my inbox with e-mails from enthusiastic home cooks: some raves about the recipe (thank you, I love you, too! ), some polite questions about substitutions and technique (many thanks to you, too, for wording your thoughts so nicely), and, of course, a couple standout notes from a few people for whom the world has seemingly ended due to their pudding not setting (oh, Internet, you vex me so). At any rate, all the correspondence left me with me with a serious case of rice pudding on the brain (related: having a newborn also gives you a serious case of Rice Pudding Brain--coincidence?). So I gave into the craving and whipped up a batch the other day (you know, for quality control), and while working through the recipe, I realized that to the inexperienced, a traditional, eggless rice pudding recipe like the one in Pure Vanilla can be tricky to master, and we all know what I stickler I am for giving you clear, concise recipes that work. So in the interest of always being Your Kitchen Pal, I thought I'd lay out a few tips to lead you to rice pudding success, and point out a couple things that are listed in the recipe, but might benefit from further emphasis or clarification. First, the amounts listed in the recipe are correct--6 cups whole milk to 2/3 cup medium grain rice. As crazy as that ratio seems, it's pretty typical of traditional rice puddings made with medium grain rice. I don't recommend low-fat milk, which will make for a thin, watery, less flavorful pudding. Also, the importance of using a rice specifically labeled medium grain rice cannot be overstated. Regular white long grain rice will not work here. It doesn't have enough starch in it to thicken and set the pudding. Medium grain rice can be a challenge to find in some places, but most well-stocked grocery stores should carry it. If it's not by all the other rice, check the ethnic foods section--medium grain rice is used a lot in Spanish cuisine. It's starch content is somewhere between a long grain rice (not enough starch) and short-grained risotto or arborio rice (very starchy, can make for a gummy finished pudding). Second, keeping the pudding at a simmer during the entire cooking time is crucial--you're looking to mostly cook the rice during the first 15 minutes while the pot is covered, and then reduce the liquid a bit during the second half of the cooking time with the lid off. Depending on your stove, you may need to play with the heat to make this happen. If the pudding stops simmering at any point, you'll need to raise the heat to keep things bubbling, stirring often as indicated in the recipe to encourage the rice to release its starch once the pot is uncovered. This usually takes about 15 minutes, but it may take a couple minutes more depending on your stove and the pot you're using. Just keep an eye on the consistency--it will be slightly thickened and the rice will be very tender when it's done. It will appear a bit soupy when its still hot--this all will change when the pudding is chilled. The last point in the recipe that I thought might possibly be tripping people up is the size of the pot used to cook the pudding. The recipe calls for a large, heavy-bottomed saucepan. Even though you're dealing with 6 cups of milk, which can technically fit into a 2 quart-ish, medium saucepan, you need a bigger pot than that (3 to 4 quarts-plus) to make sure you're working with enough surface area to encourage the mixture to reduce and thicken in the time noted in the recipe. A too-small pot calls for more cooking time to get to the visibly thickened consistency you're after before chilling the pudding. I hope some of these tips clear up any questions and/or issues that may have popped up with this particular recipe. Feel free to add further questions in the comment section! I'm here for you, people. And now back to baby nibbling. Note that this recipe calls for medium-grain white rice, not long or short-grained Arborio rice. Medium-grain rice lends the perfect amount of starch, creaminess and texture to the finished pudding. To transform this recipe into Warm Vanilla-Rum Rice Pudding: Add a warm, boozy glow to the whole thing by whisking in two large egg yolks to thicken it without chilling, and add a shot of dark rum during the last five minutes of cooking time. In a large, heavy-bottomed pot, combine the milk, rice, sugar, vanilla pod and caviar, and salt. Stir gently over medium heat, until the mixture reaches a simmer. Cover the pot and reduce the heat to low. Simmer for 15 minutes. Uncover the pot and continue to cook the pudding, stirring often, until the rice is very tender and the pudding has thickened slightly, about 15 minutes more. Remove the pan from the heat and let cool for 5 minutes before fishing out the vanilla pod and transferring the pudding to a heatproof bowl. Chill in the refrigerator until cold and thick, at least 4 hours, or up to overnight.